Best Food Specials and Deals in the Triangle! New Restaurants and Bars, Coming Soon to Raleigh, Durham, Cary and Chapel Hill! 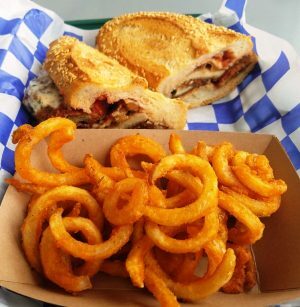 Best Dishes and Meals in the Triangle! 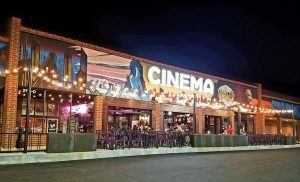 While it’s always good to see new restaurant concepts open up in the Triangle, it’s always more interesting to see restaurants opening up with a cause. And that was the case with Carroll’s Kitchen. I attended their launch party way back in April because I was curious about the concept: helping homeless women in Raleigh through re-training and a restaurant. I had a chance to meet the people behind Carroll’s Kitchen (Jim Freeze, Vicky Ismail) but it was still too early for food. Flash forward to September and a media preview event gives me a chance to sample out their food. And now here in December I’ve had a chance to try out their full retail experience. I’m always a supporter of any good causes but I’m also a believer in good food and moving the Triangle dining scene forward. And I’m happy to say that Carroll’s is doing a great job there, for real! 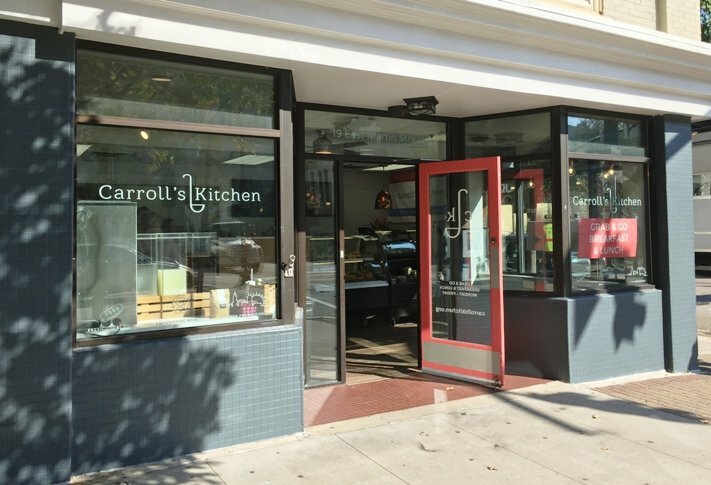 Located on the corner of Martin and Wilmington Street, Carroll’s Kitchen will eventually be moving to a bigger space but enjoy it here in this convenient downtown location for now. 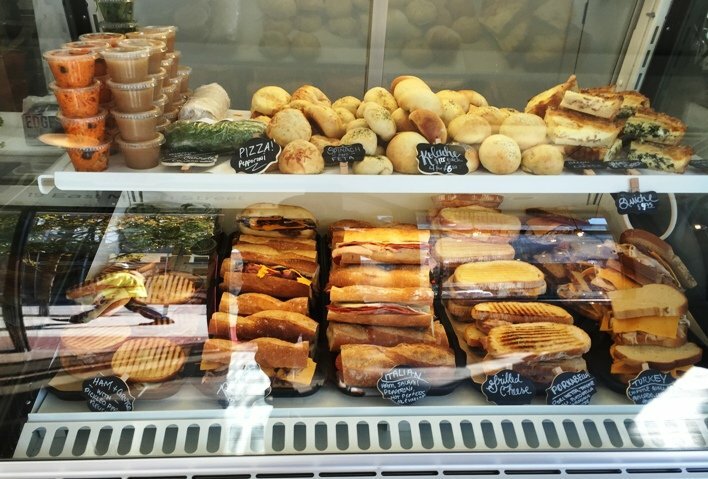 Inside, you’ll find a couple of display cases with their sandwiches, quiches, pastries and more. Carroll’s is meant to be grab and go but also does catering for events. The menu is simple but quirky. What caught my eye today was their kolaches which is a pastry more common to Texas and of Czech descent. 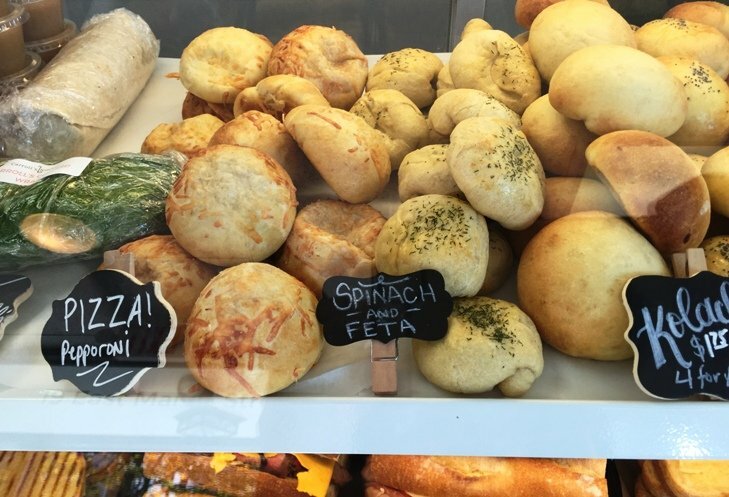 You can get a variety of kolaches here both in sweet and savory form. I go with the grilled ham panini along with some apple and pepperoni pizza kolaches for my visit! I rush home for mah lunch and unwrap the eats, yum! 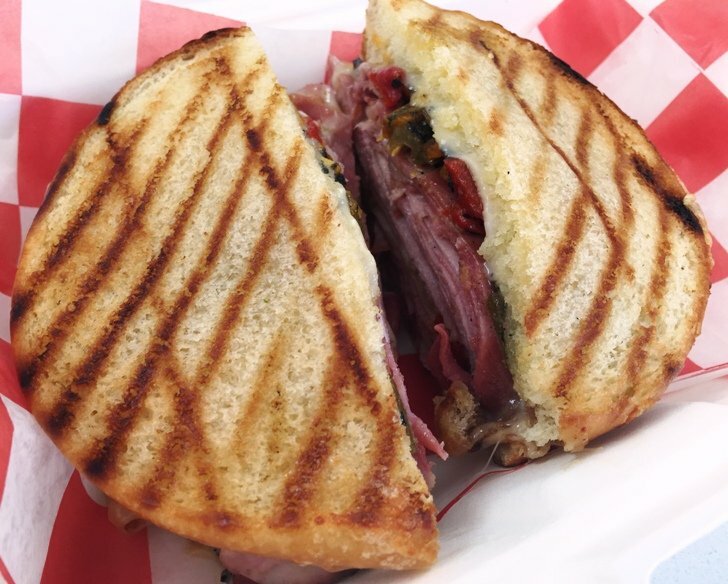 It all looks great, the Carroll’s Kitchen ham sandwich sports beautiful grill marks and is stuffed with thin-sliced ham, melty cheese and a layer of pickled peppers. And while I’m not a ham fan, the thin layers of meat work well here, making for a more tender and less salty bite. The pickled peppers add just a bit of acid and flavor to play off all the savory here, a wonderful touch. The kolaches I’ve ordered come in two forms: the more traditional flattened pastry for the apple and a ball form for the pepperoni pizza. Carroll’s Kitchen allows you to mix and match four kolaches for $6 which is a wonderful deal. I heat up my pepperoni kolaches and they are dee-licious! The pastry has a thickish crust but once you break through, the interior is lighter and wraps up the tomato, pepperoni and cheese beautifully. Great baking touch here. And a thumbs-up to the apple kolache for a sweet ending. Retake: Toast Paninoteca, Still a Hidden Gem for Sandwiches in Durham! First Take: Wilson’s Eatery in Raleigh, a Delicious and Casual Spot for Bites and Beer!